Playing With Yeast | I made that! We meet again. This time things got intense. As per usual I was dabbling in vegetarianism, reading books like “Animal Factory” and “Eating Animals” and having thoughts like “I just can’t keep eating meat”. Then I bought a groupon for Barnes and Noble. Dammit, I blame it on them. I was perusing the shelves, looking for just the right present to myself (I’ve imposed a cookbook moratorium on myself so this was a big day). Then I saw it. A book I’ve been dreaming about since I read about it online: “Asian Dumplings” by Andrea Nguyen. My Lord, it’s like she wrote a book just for me. I snatched it up and stayed awake that night reading it cover to cover. But I’ve been so busy with my new business that I just didn’t have time to make anything from it for months! But finally, I got a day off. And what did I do? I made pork buns. Sticky, messy, slightly sweet, cracktastic pork buns. 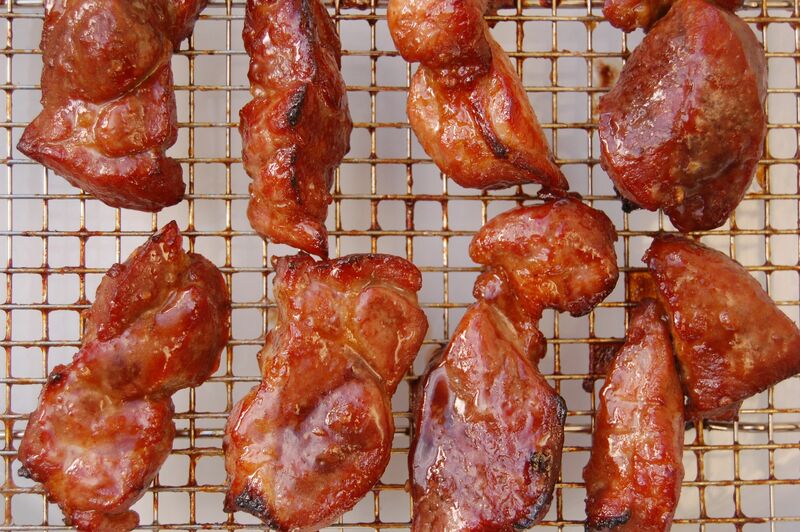 First I marinated you in a magical sauce with all kinds of delicousness: five spice powder, hoisin sauce, honey, soy sauce and much more. Then I laid you on a rack to go in the oven. And roasted you until you were all glossy and charred and happy looking. From there I took it a step further. I chopped you up into itty pieces and cooked you with more delicious sauciness. While you waited patiently, I made a dough, a dough not too different from my favorite hamburger bun dough. I cut that dough into chunks. And then I encased you in that dough, giggling with every pleat. I let your dough rise until soft, and then I roasted you again. 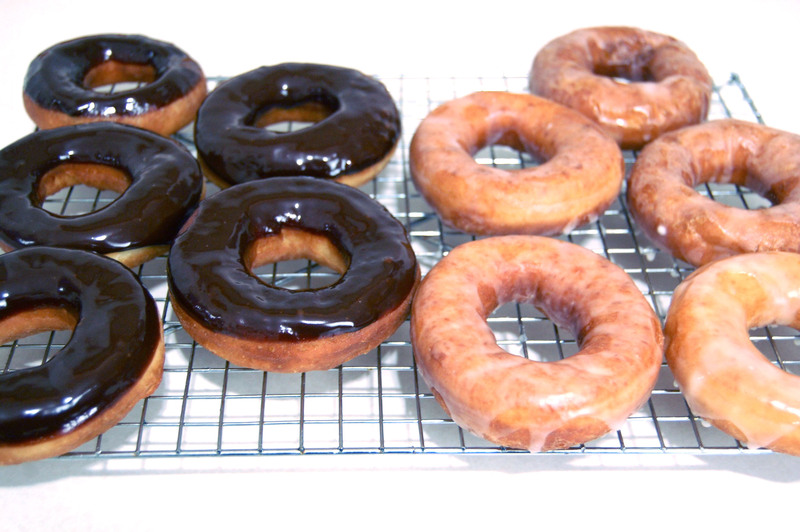 I pulled you from the oven and glazed you with honey. And then me and friends devoured you. Oh my, sweet pork, you do continue to surprise me. Thank you, for setting me straight again. 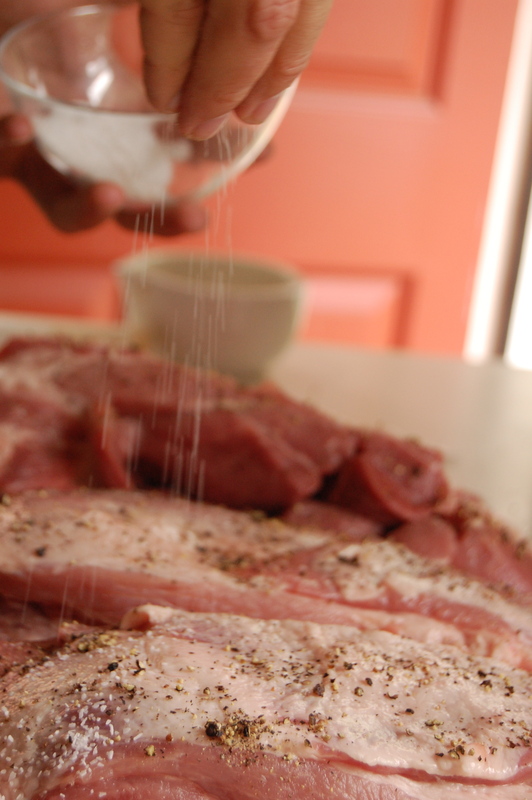 – Cut the pork into strips that are 1 1/2” thick. 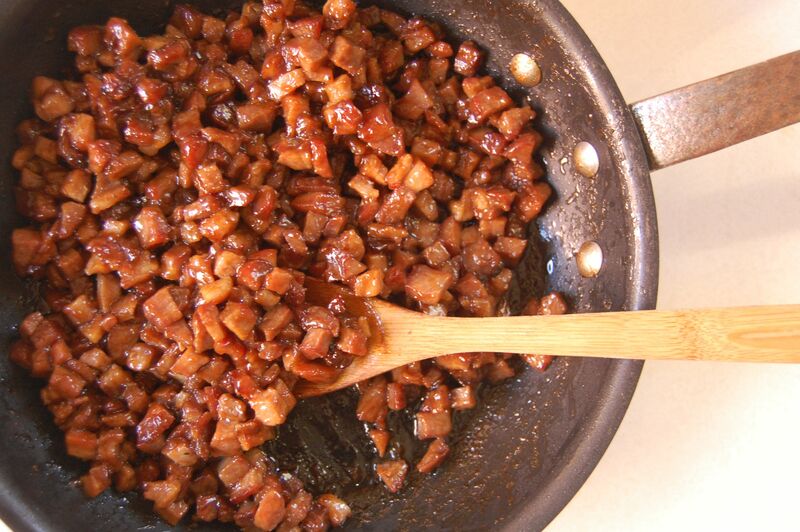 – Mix the rest of the ingredients in a bowl large enough to fit the pork, this will be the marinade. 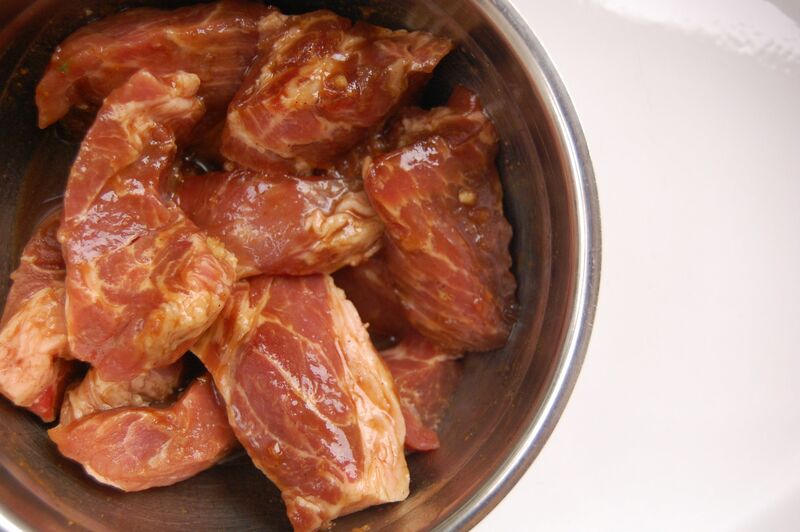 Remove 1/3 of the marinade to a small bowl and store in the fridge. This will be used later on for basting the pork as it roasts. Toss the pork in with the rest of the marinade to coat evenly. Cover and refrigerate for 6-8 hours, turning the pork 2-3 times. 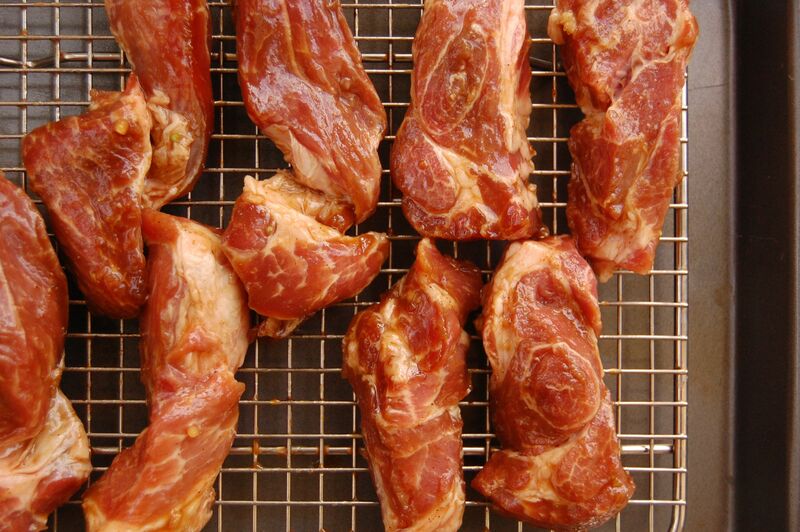 – Remove the pork and reerved marinade from the fridge and let sit at room temperature for 45 minutes. Preheat the oven to 475 degrees. Line a baking sheet with aluminum foil and place a roasting tack on top. Put the prok on the rack, leaving an inch between the pieces for heat circulation. Discard the used marinade. 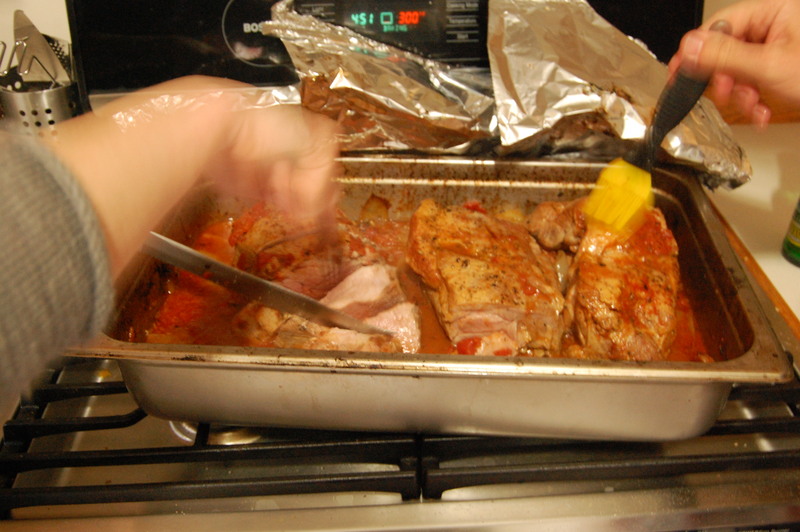 – Roast for 30 minutes, basting both sides of the pork with the marinade every 10 minutes. Flip the pieces over at every interval. T]he pork is done when it is glazed and slightly charred, Remove from the oven. Let the meat rest for 10 minutes before using. – To make the flavoring sauce, combine the sugar, salt, white pepper, soy sauce, oyster sauce, and water in a small bowl. Stir to dissolve the sugar and set aside. – For the dough, melt the butter with the milk in a saucepan over medium heat. Set aside to cool for about 5 minutes, or until warm (about 110°F). – Put the yeast in small bowl, add the water, and set aside for 1 minute to soften. Whisk in the milk mixture and the egg to blend. – Combine the sugar and flour in a food processor. Pulse two or three times to blend. With the machine running, pour the yeast mixture through the feed tube in a steady stream. 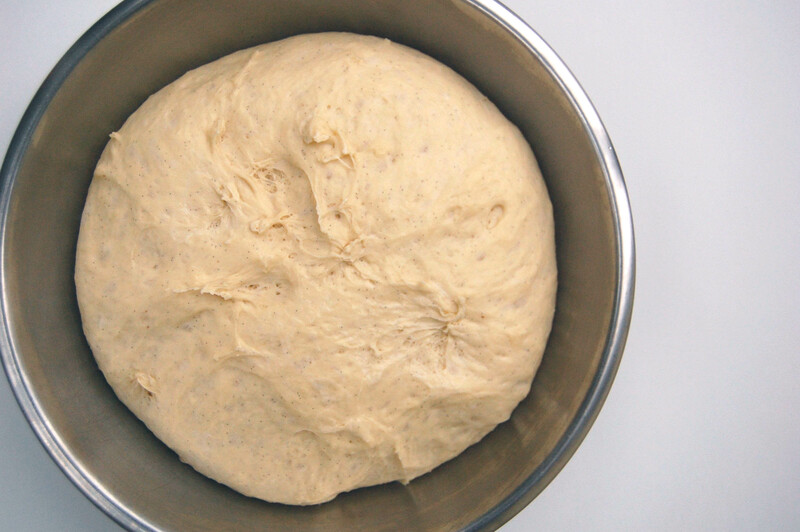 After a sticky mass of very soft dough forms, about 5 seconds, continue processing for 45 to 60 seconds to form a smooth, slightly sticky dough that mostly cleans the bowl. The finished dough should stick a bit to your finger when pressed. Alternatively, to make the dough by hand, combine the sugar and flour in a large bowl. Make a well in the center and pour in the yeast mixture. Slowly stir with a wooden spoon to work in all the flour. (Add water by the teaspoon if this doesn’t happen with relative ease.) Keep stirring as a ragged, soft mass forms. Then use your fingers to gather and pat the dough into a ball. Transfer to a work surface and knead for about 5 minutes, or until smooth, fingertip soft, and slightly elastic. (You should not need any additional flour on the work surface if the dough was properly made. Keep kneading and after the first minute or two, the dough should not stick to your fingers. If it does, work in a sprinkling of flour.) Press your finger into the dough; it should spring back, with a faint indentation remaining. – Regardless of the mixing method, lightly oil a clean bowl and add the dough. Cover with plastic wrap and put in a warm, draft-free place (for example, the oven with the light on) to rise for about 45 minutes, or until nearly doubled. 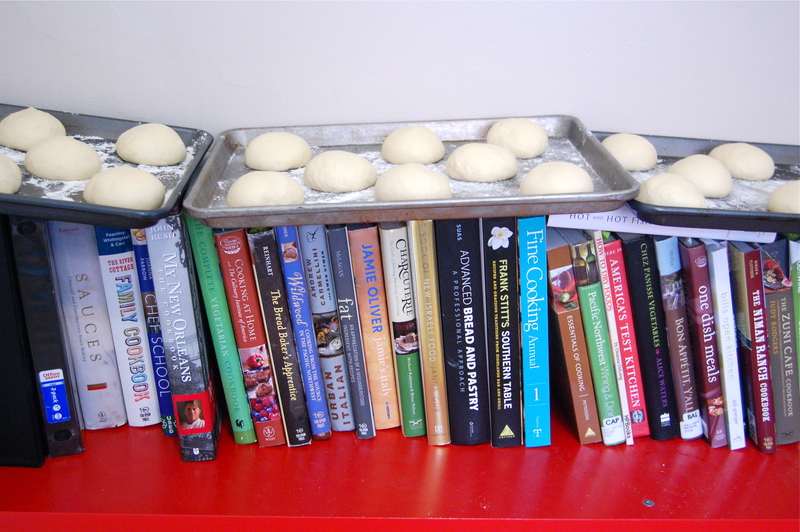 – Line 2 baking sheets with parchment paper before beginning to assemble the buns. 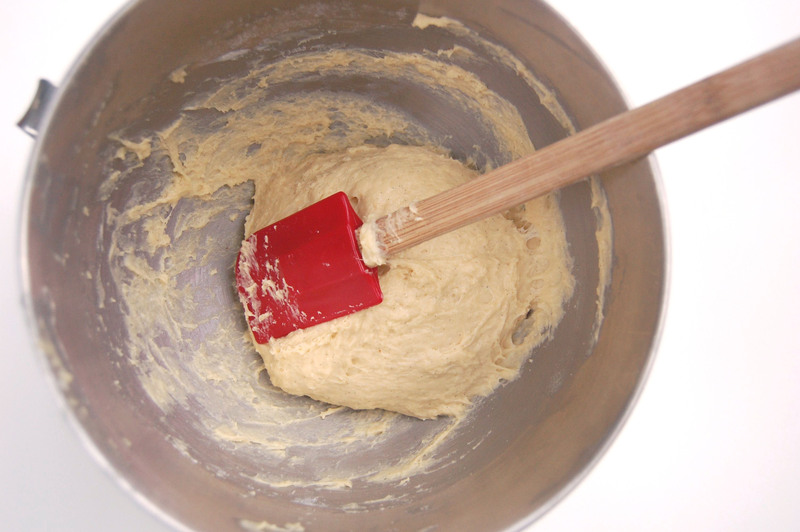 – Remove the dough from the bowl and put on a lightly floured surface. Knead it a few times, then cut it in half. Cover one-half with plastic wrap or an inverted bowl to prevent drying. 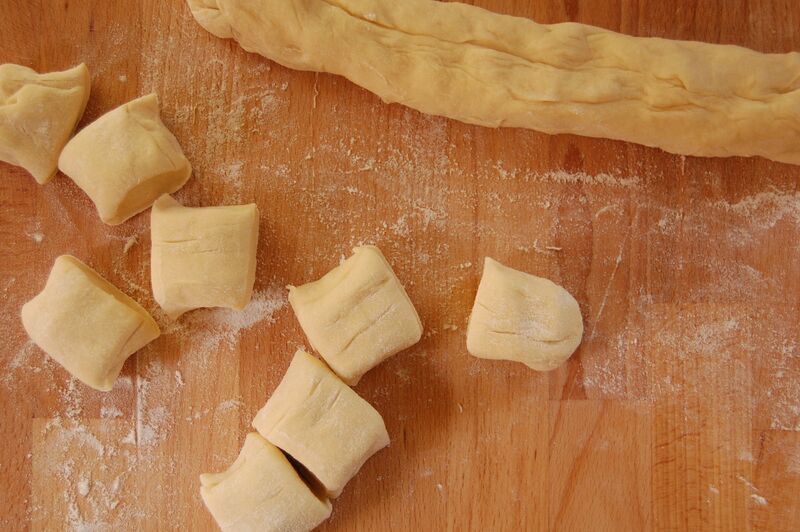 Roll out the dough into a 12-inch log, and then cut it into 8 or 16 pieces for medium or small buns, respectively. (Halve or quarter the log first to make it easier to cut even-size pieces. The tapered end pieces should be cut a little longer than the rest.) Lightly roll each piece between your hands into a ball and then flatten each one into a 1/4-inch-thick disk. Use a wooden dowel-style rolling pin to roll the pieces into circles, about 2 1/2 inches in diameter for small or 31/4 inches in diameter for medium buns. 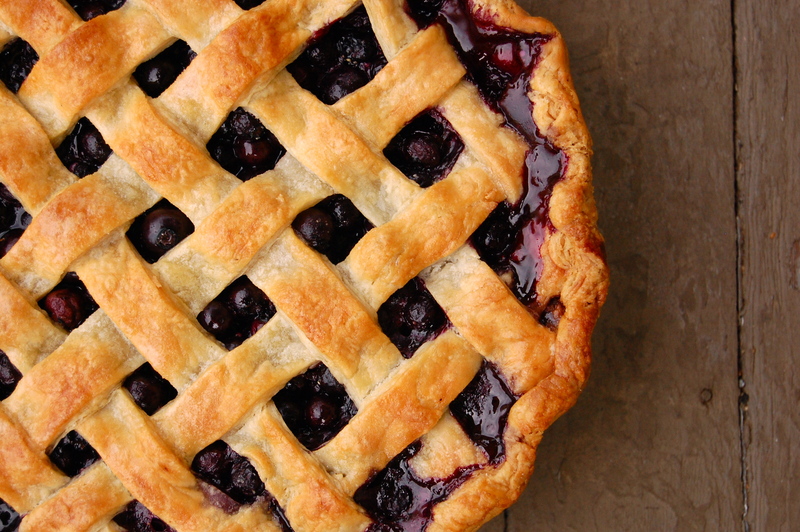 The rim should be thinner than the center; keep a 1-inch-wide belly. The finished circle will rise as it sits. 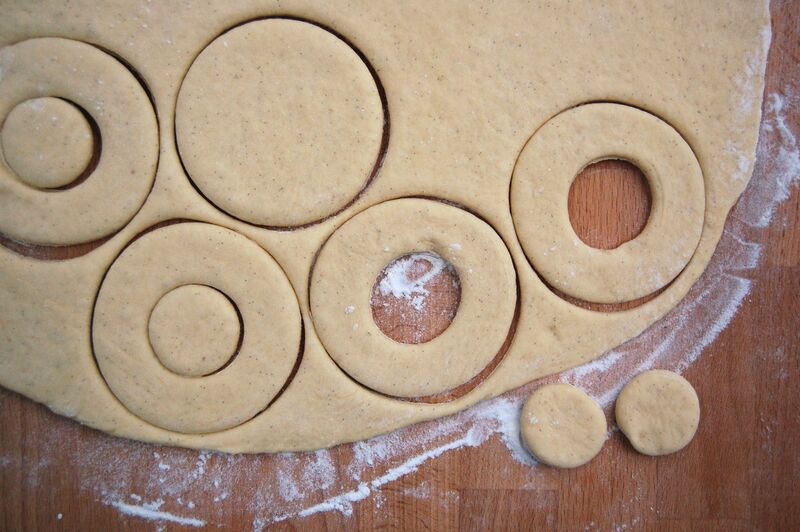 Lay the finished circles out on your work surface, lightly dusting their bottoms with flour if you fear they will stick. 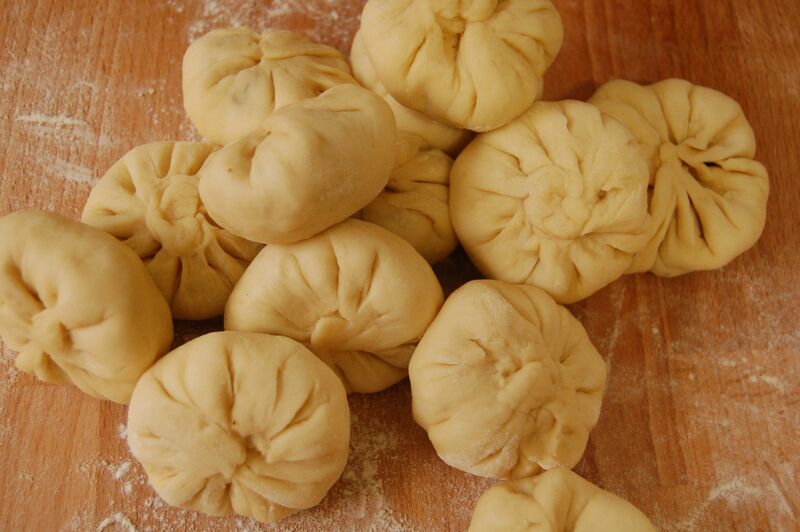 – To form a bun, hold a dough circle in a slightly cupped hand. Use a spoon or fork to center about 2 teaspoons of filling for small buns, or about 4 teaspoons of filling for medium ones, on the dough circle, pressing down very gently and keeping about 1/2 to 3/4 inch of the dough clear on all sides; your hand will automatically close slightly. 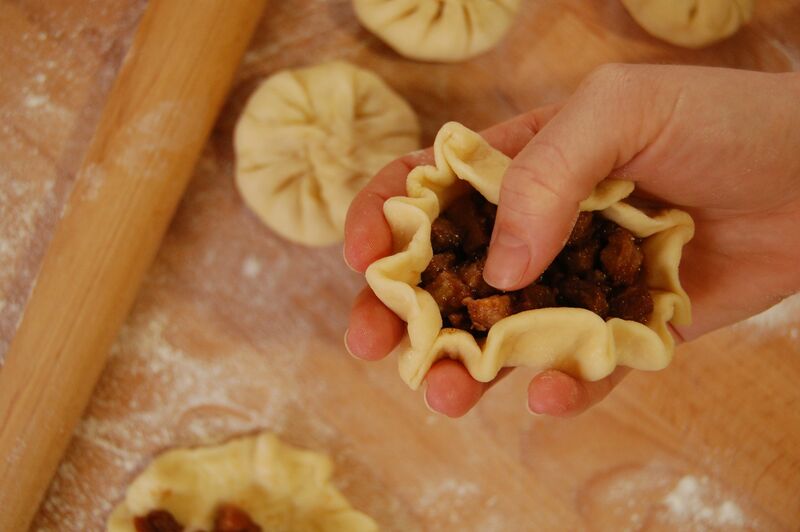 Use the thumb of the hand cradling the bun to push down the filling while the other hand pulls up the dough edge and pleats and pinches the rim together to form a closed satchel. Pinch and twist the dough closed at the end. Place the bun pleat side down on the prepared baking sheet. 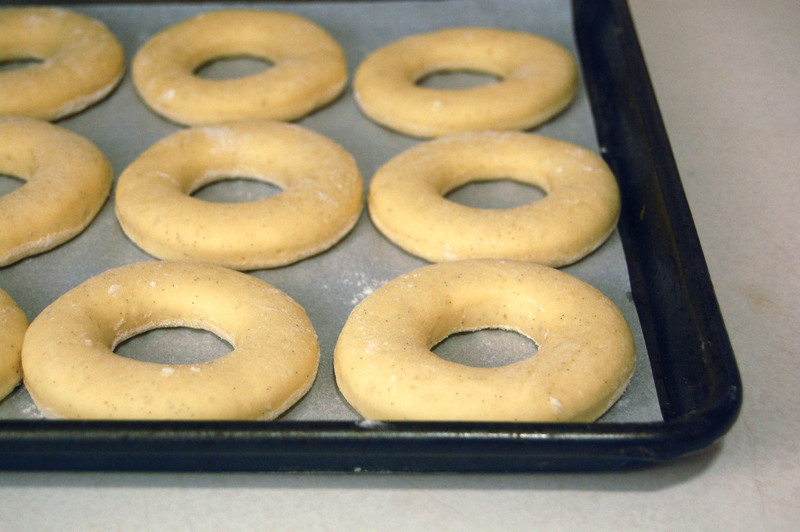 Repeat with the remaining dough circles, spacing them 11/2 inches apart on the baking sheet. Loosely cover with plastic wrap or a kitchen towel. Set in a warm, draft- free place (for example, the oven with the light on) for 30 minutes to rise. Meanwhile, work on the other dough half to form more buns. 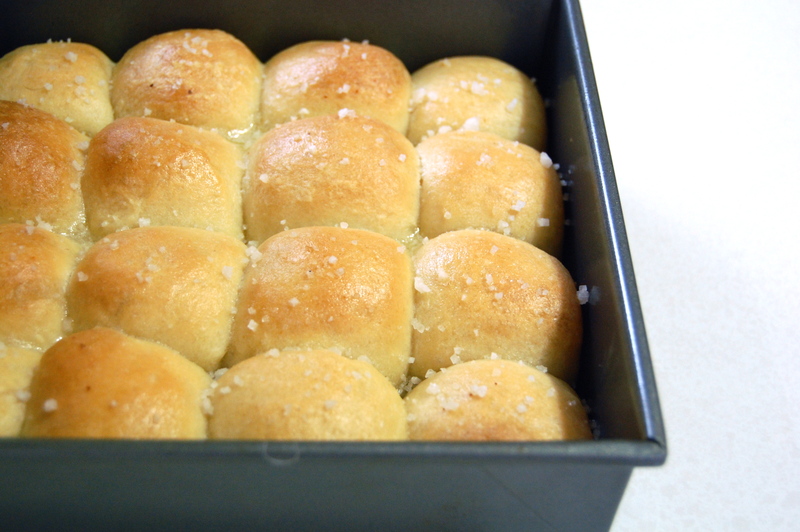 – Bake one baking sheet at a time, brushing the top and side of each bun with the egg right before baking. 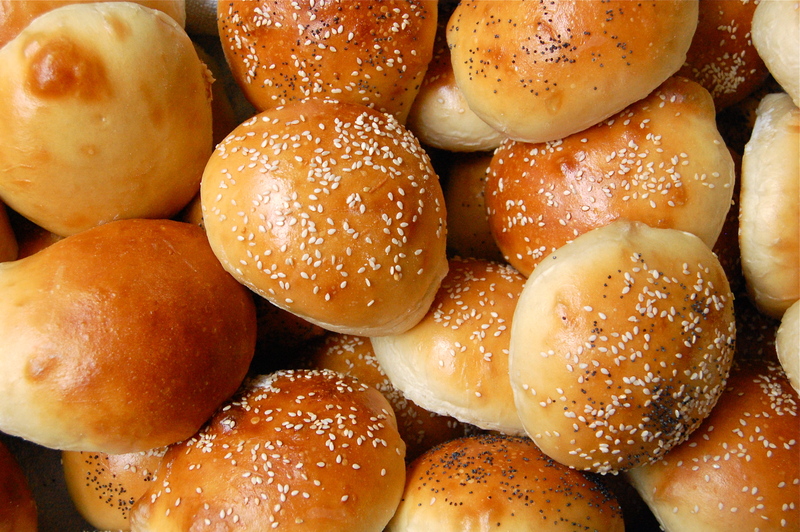 Bake small buns for about 14 minutes and medium buns for about 18 minutes, or until a rich golden brown; the cooked buns sound hollow when tapped on the bottom. 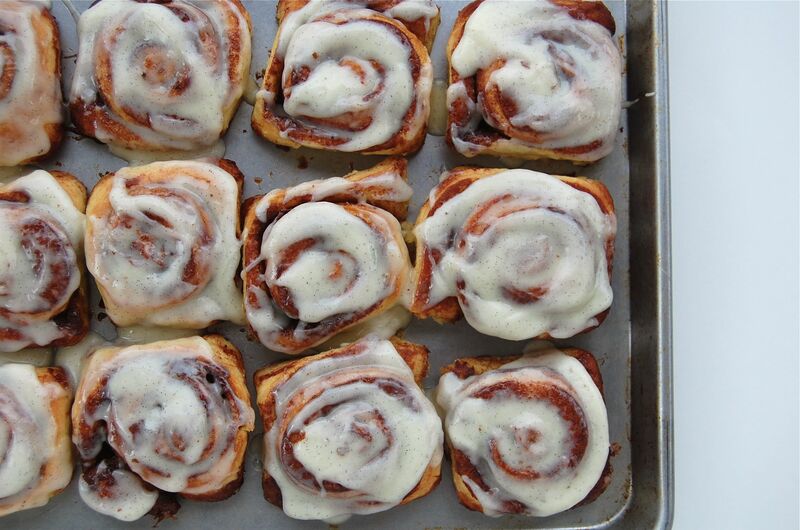 Remove them from the oven, set on a rack, and let cool for 5 minutes. 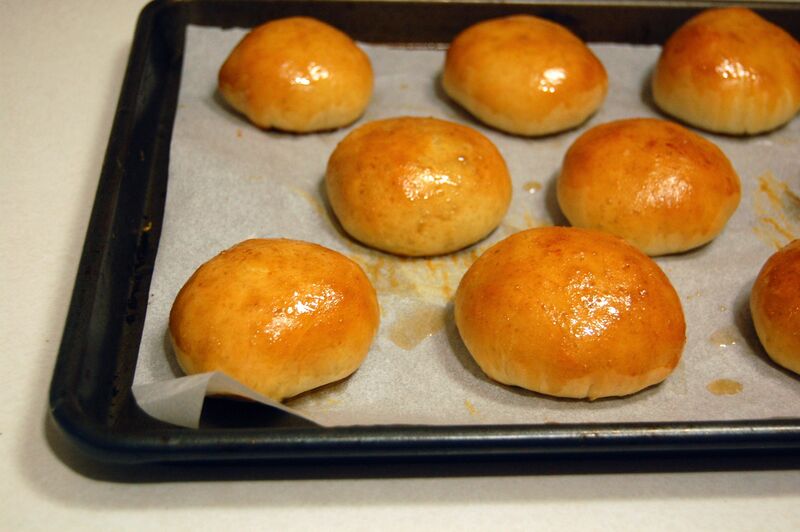 – Brush the honey mixture on the buns for a sweet-glaze finish that will also soften the crust. Enjoy warm and out of hand. 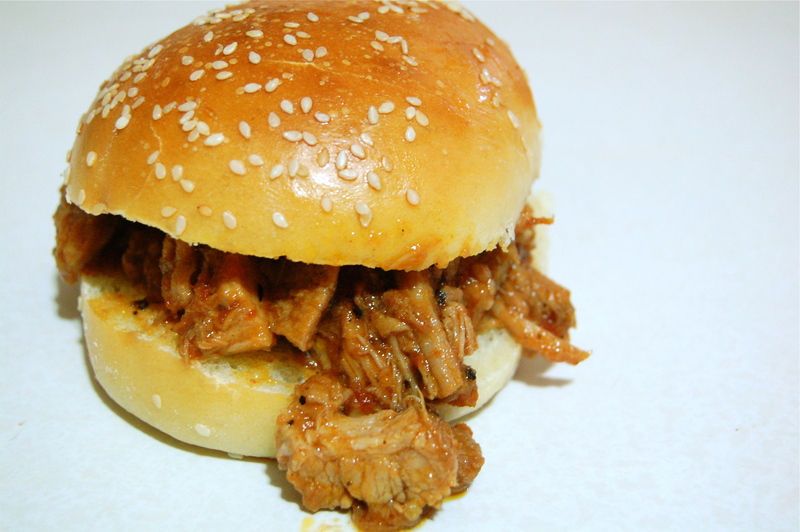 Refrigerate left- over buns for up to a week and reheat at 350°F for 8 to 10 minutes, until hot. 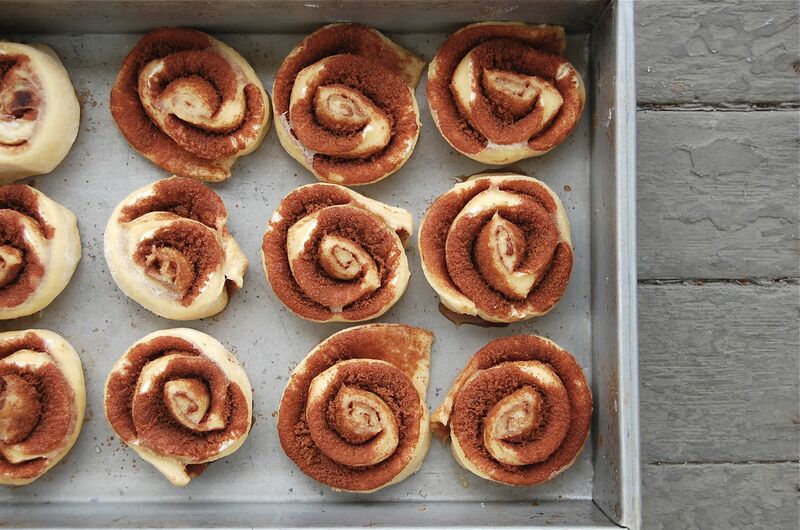 When making the buns in advance, wait to brush on the glaze until after you’ve reheated the buns. 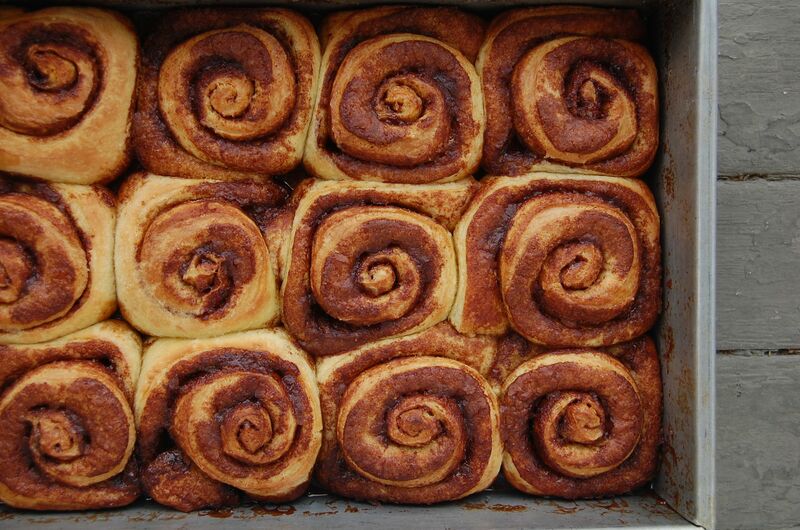 These buns may also be frozen for up to a month. Thaw them completely before reheating. Sometimes I just have these cravings…Southern cravings. They come on fast and hard and suddenly I just NEED to recreate something from my younger days. Yesterday I was entertaining friends for brunch. The night before, I was flipping through cookbooks, trying to find something complex and interesting to make. I was feeling particularly uninspired until I passed over a recipe for angel biscuits, which are basically biscuits leavened with yeast along with the more traditional baking powder. My mouth instantaneously started drooling as I recounted the feathery light biscuits the South is known for. And then there was nothing else I could possibly cook. There was no complicated quiche, no perfectly stacked benedict and certainly no fancy-pants pastry that could substitute for that biscuit. 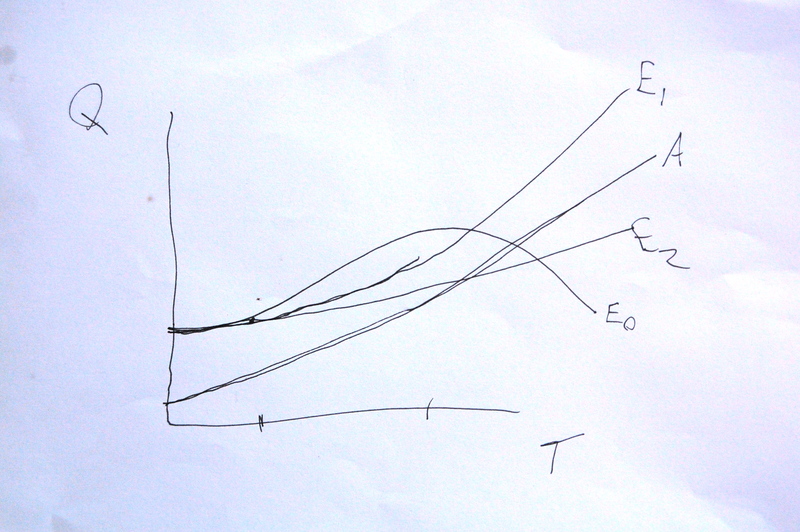 Thus, it was on. And of course, where there’s biscuits, there’s bacon gravy. But the biscuits. Did I mention they have yeast in them? And of course, lard. Yes, I keep a block of lard in my freezer. I rubbed the lard with some butter into my flour mixture. And then poured in the yeast and some buttermilk. I mixed (but just barely) that into a dough, pressed it out and stamped out my biscuits. Then I let them rise by the fireplace until they were nice and puffed. And then baked them until they had a nice crispy crust. And oh boy, they were yummy. Pretty much the perfect biscuit. So good that it almost seemed like a waste to pour gravy all over them. Not that that stopped me. But could I stop with the biscuits and gravy? No. I wanted more. I wanted dirty. I wanted pimento cheese. Chances are that if you live on the wrong (or right) side of the mason-dixon line, you’ve never heard of such a thing. Let me tell you, it is kinda gross. And delicious. Think cheddar. Mixed with roasted peppers (In the South they have these jarred pimentos, I have no idea what makes those so special or why you can only get them there). And mayonnaise. Oh yes, I went there. But since I DO have my limits, I at least made my own mayonnaise. Because that jarred stuff gives me the willies. In a big bowl I threw in shredded cheddar, finely diced roasted red peppers, paprika, cayenne and some black pepper. And stirred in my mayonnaise. Like I said, Dirty. It was not a brunch for the delicate eater, and I suspect I actually scarred Tessa (even though I totally caught her dipping a finger in the pimento cheese when she thought no one was looking), but it was worth the heartburn. – Dissolve the yeast in the warm water, let stand for 5 minutes. Stir in the room temperature buttermilk. – Put the flour, sugar, baking powder, baking soda and salt i a large bowl. Mix thoroughly. Using your fingers, rub in the lard and butter, being careful to keep large flat pieces. – Stir in the yeast and buttermilk and mix until just blended. – Turn dough onto a lightly floured surface and knead a few times, to make smooth. 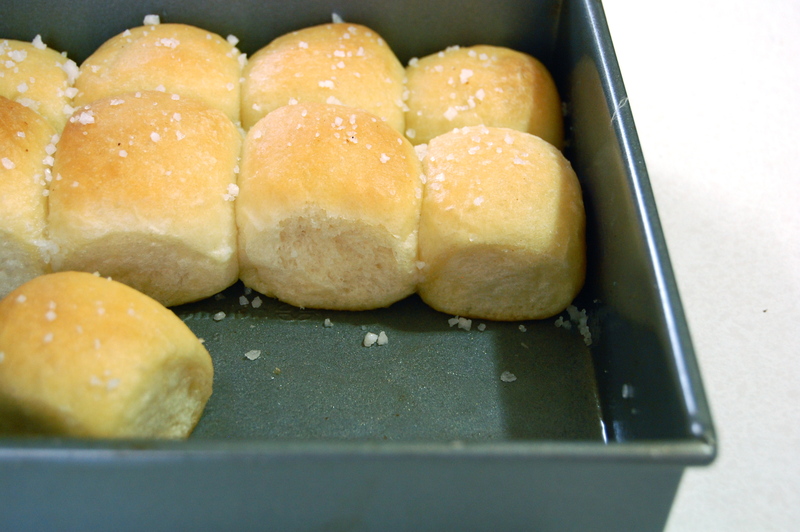 Roll to a thickness of 1/2″ and stamp out biscuits. – Place biscuits on a parchment lined baking sheet. Cover lightly with plastic wrap and let rise in a warm place for 45 minutes. 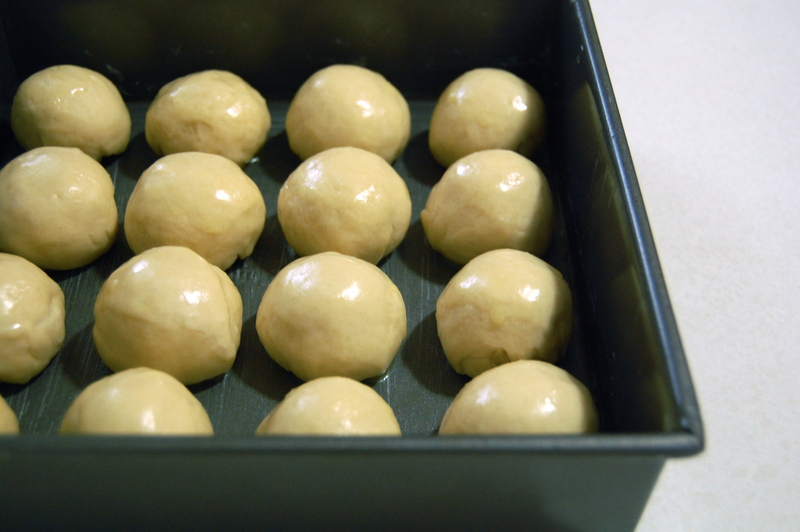 – Brush tops with melted but and bake in a preheated 450 oven for about 12 minutes, until golden brown. Today I learned something important: Pretzels can be really awesome. Homemade pretzels have been on my list for a while now, and I just kept putting them off. To be honest, I’ve never been a huge fan. And, well, my jaw doesn’t work so good sometimes and pretzels can be a real workout for the ole temporomandibular joint. But yesterday I made them. And they changed everything I’ve ever thought about pretzels. Seriously, I thought that I would take a nibble and then let John work his way through the pile. But after one bite I was ready to fight to the death for my second pretzel. Needless to say, these pretzels didn’t last 8 hours before being claimed by loving tummies. So I now know: T\there is not much better than a hot-out-of-the-oven pretzel, and I thank Sherry Yard a thousand times for sharing this recipe in her cookbook. And did I mention they’re pretty simple to make? 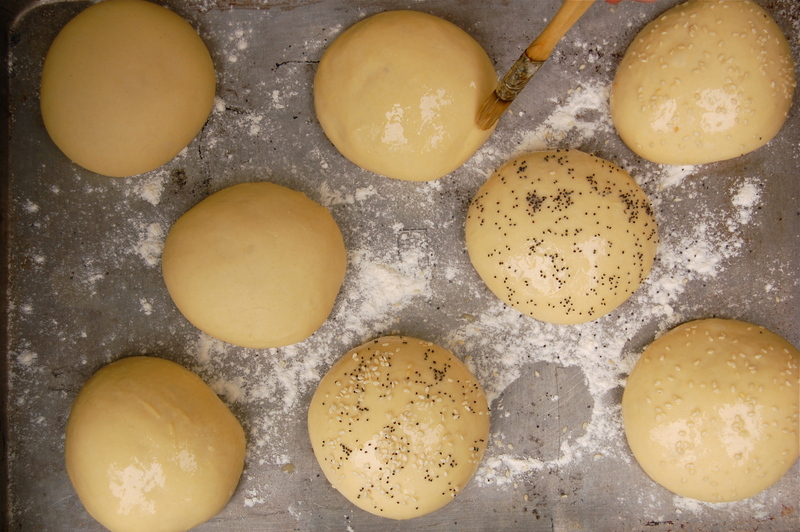 You start out with a dough. After the dough proofed I flattened it into a rectangle and chopped it into 8 pieces. Then came the fun part: shaping. I think I got a tad carried away with the kneading, thinking gluten development was essential for the classic chewy pretzel. It made shaping them into ropes a bit trying, but eventually they got there. It’s important to get the dough fairly thin, because it’s going to be a lot thicker when you’ve finished. I let the shaped pretzels proof a bit more on some oiled parchment. Then I boiled (actually simmered) them. I think what made this recipe awesome was the amber beer in the simmering liquid, you could really taste it in the final pretzel! I put them back on the parchment, brushed them with oil and sprinkled them with coarse sea salt. Then into the oven they went until they were nice and toasty. And let me tell you, absolute perfection. I highly recommend this recipe to the pretzel fans and skeptics out there. – In a measuring cup, dissolve the yeast in the water and let sit for 5 minutes, or until cloudy. Add the buttermilk, brown sugar, sugar, and vegetable oil and mix well. – Place the flour and salt in a bowl. Add the liquid mixture and knead until smooth. – Brush a large bowl with vegetable oil. Scrape out the dough and place in the bowl. Cover with plastic wrap and let sit at room temperature for 1 hour. – Line 2 half sheet pans with parchment paper and brush with oil. Lightly oil your work surface and your hands. 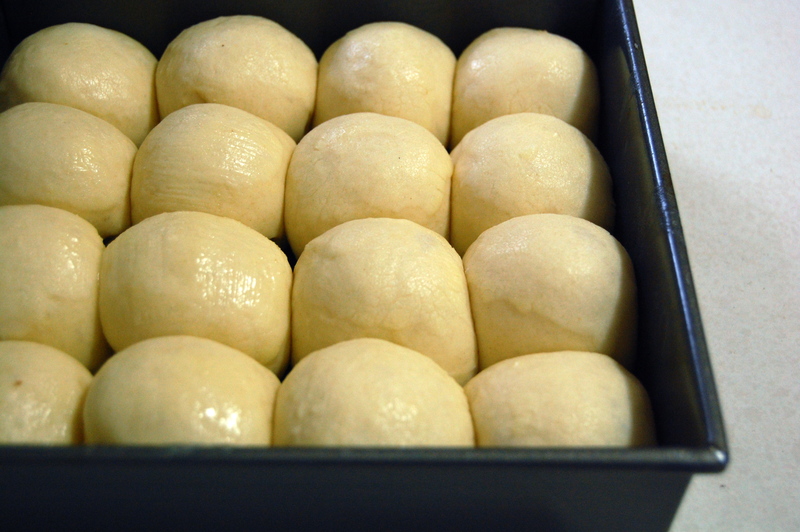 Remove the dough from the refrigerator and press into a 6-inch square. Cut into 1 1/2 by 3 inch rectangles. One at a time, shape each piece into a pretzel. (Cover the pieces you aren’t working on with plastic.) Roll each piece out into a 24-inch long rope. Shape into a U, then crisscross the ends halfway up, twist them together like a twist-tie, and pull the legs down over the bottom of the U. Place the shaped pretzels onto the lined baking sheets. Cover with lightly oiled plastic wrap and allow to rise for 30 minutes, or until not quite doubled. – While the pretzels are rising, place racks in the upper and lower thirds of the oven and preheat the oven to 450 degrees F. Cut the parchment the pretzels are on into squares to facilitate lifting and transferring the pretzels into the water bath. – In a 10-inch-wide stainless-steel pot, combine the water, beer, baking soda, and brown sugar and bring to a simmer. Two at a time, lift the parchment square with pretzel and carefully reverse the pretzel off the parchment into the simmering water. Cook for 10 seconds and flip, using a skimmer or slotted spoon. Cook for another 10 seconds, and with the skimmer, lift above the pan to drain. Then transfer back to the baking sheets, rounded sides up. Brush with vegetable oil. Dust with coarse salt. – Bake, switching the sheets from top to bottom and rotating from front to back halfway through, for 15 minutes, or until the pretzels are chestnut brown. Remove from the oven and serve warm. Be sure and check the bottoms, mine got a little toasty! It’s my first time making raspberry jam, and it’s super easy! I generally go with almost equal parts sugar to fruit (by weight), but with just a tad less sugar. I heated it on low for 10 minutes, to break down the berries a bit and dissolve the sugar. Then I boiled it for about 15 minutes, until it appeared set. We are now officially overflowing in homemade jam. But I can’t stop making it. – Heat in pot on low for 10 minutes to dissolve sugar. – Once dissolved, bring to rapid boil and cook for about 15 minutes (this time changes depending on your quantity of berries), or until set. – Immediately pour into sanitized jars and seal. – Whisk together flours, instant yeast, and salt in bowl. – Mix together warm water, melted butter and honey in bowl. Add to flour mixture. – Knead for about 5 minutes, until smooth and elastic. If too wet, add a bit more flour. – Transfer to a floured baking sheet and pat down to be 1″ thick. – Let chill, loosely covered with plastic in fridge for 15 minutes (or overnight if you wrap tightly). – Roll out on floured surface to a bit more than 3/16″ thick. Use a round cutter to cut circles. Knead scraps together and place back in fridge to chill for another 15 minutes before rolling out again. – Let circles rest at room temperature, covered with a towel, until almost doubled in size (the time depends on how hot your kitchen is, crank the heat up and it will go faster). – When dough is ready, heat up cast iron skillet over medium – low heat. Sprinkle with cornmeal. Cook 1 muffin at a time until you get the heat right. Sometimes it takes a few rounds to get the heat right, but basically you want your muffin to cook through with 8-9 minutes on each side. I get paranoid and always place them in the oven for 10 minutes after cooking on the skillet. – Let them cool and toast and dig in!